Since the beginning of the Great March of Return at the end of March, the Israeli military has left no doubt that it will not feel restrained in dealing with Gaza’s demonstrations. 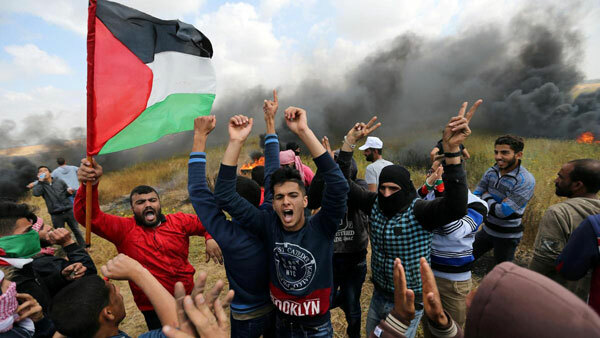 With rules of engagement that have left at least 125 demonstrators dead, more than 5,000 wounded by live fire, among them over 800 children, the message is clear: Protest and risk death and injury. He was first injured, he told The Electronic Intifada, in an Israeli airstrike 2002 that left him needing several surgeries to remove shrapnel from his right hand. In 2014, during Israel’s 51-day offensive on Gaza, he was injured again in the same hand in another airstrike, and this time needed a metal implant that he still carries around. And during the latest protests he was hit in the chest by a tear gas canister leaving him out of action for five days. “Our humanitarian work is greater than the Israeli occupation,” al-Hissi said. A sense of duty, he said, carried him through the tear gas, the blood and rubble. Al-Hissi said he has been shocked at the number of casualties and not just among protesters. He has reached out to international organisations including the International Committee of the Red Cross and the World Health Organisation to help them pressure Israel not to target paramedics doing their jobs. Among the many injured multiple times in the line of duty during the Great March of Return is Ibrahim Talalqa, 23. Talalqa volunteered in a civil defence medical services team for three years to become a certified paramedic. He has been wounded three times in the past three months, most recently on August 3 when he was strafed by shrapnel while attending to an injured youth. The shrapnel, he said, came from an exploding bullet that detonated near his ambulance as it was approaching the injured person. Talalqa remembers the May 14 protests as the worst – these also claimed the most casualties of any of the series of demonstrations to date. He was not wounded on this occasion, but it was close. Adel al-Masharawi is another veteran paramedic. The 41-year-old began in 2000 and says the situation has only become worse. He has fainted four times during the recent protests as a result of inhaling tear gas and is convinced that the chemical composition of the gas has changed over the years. He worries that too much exposure will result in future diseases. On August 3, Bashar al-Muzaini, 18, found himself on the edge of the protests waving a flag and wearing the distinctive black-and-white Palestinian kuffiyeh. He and friends were staying at a distance of 500 metres from the boundary, a distance they thought would be safe. But at one point, as a thick cloud of tear gas descended on the group, al-Muzaini found himself alone, nauseous and disoriented. Al-Muzaini later realised that he had been lucky to escape only with tear gas poisoning. The area had been the site of heavy shooting while he was lost in the fog. But when he tried to thank al-Masharawi he was almost rebuffed.